I had mixed emotions about returning to Boston for the first time since I was 50 feet from the bomb shortly after finishing the 2013 marathon. 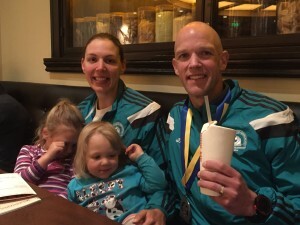 (Related – 2013 Boston Marathon Race Report) I was mostly excited because I was in great shape, injury free, and would get to experience the event with my family this time, with my wife running as well and my kids along to watch. In 2013, I had crossed the finish line and just sat down in one of my favorite restaurants, Max Brenner’s, when the blasts occurred 50 feet away. This year, the plan was for my family to join some friends immediately after the race at the same restaurant to finish the meal I didn’t get the chance to have last time. Collecting our race bib with the kids. 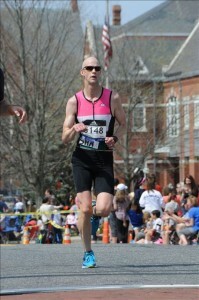 Coming into the race, I feel I was in the best shape I had been for any of the 4 previous marathons I competed in. 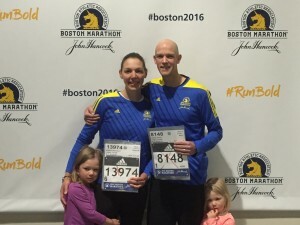 For the first time this year, I worked with a specific running coach who was guiding me through a specific 14 week Boston Marathon training program. The training had gone well for me, experiencing only a few minor injuries along the way, nailing all my workouts in the last 6 weeks and achieving a new personal best (1:21:40) in a half marathon 4 weeks before Boston. 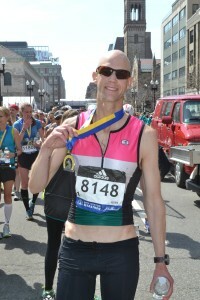 This race gave me a good gauge of where my fitness was and left me hopeful in achieving a personal best marathon time in Boston. Boston’s late April race day weather is always a concern as past years have seen temperatures just above freezing to sweltering temperatures in the 80s (high 20s oC). You never know what you are going to get and incessantly checking the forecast 10 days out unfortunately doesn’t help either. Headed to the start line. Fortunately for us, this year’s weather was near perfect, with light wind, sun and temperature around 70 (20oC) at the start. As we ran closer to Boston (the race starts in the western suburbs and runs directly east towards Boston) the temperature cooled a little and we experienced a slight headwind. I found the headwind more of an annoyance than a break as headwinds can be, especially in Newfoundland. This year, the race had just over 27,000 participants. To organize all the runners at the start, we were divided into 4 waves which start 25 minutes apart. You are placed in your wave by your qualifying time. The first time I ran Boston, I had a good qualifying time (2:57) and was put in the first wave with other runners with similar qualifying times. In 2013 it was a crowded first 5 miles as I was surrounded by people running at the same pace as me. My qualifying time for this year’s race (3:10) was slower than I am capable of but because of the slower time I was placed into the second wave with people expected to run between 3:10 and 3:25. 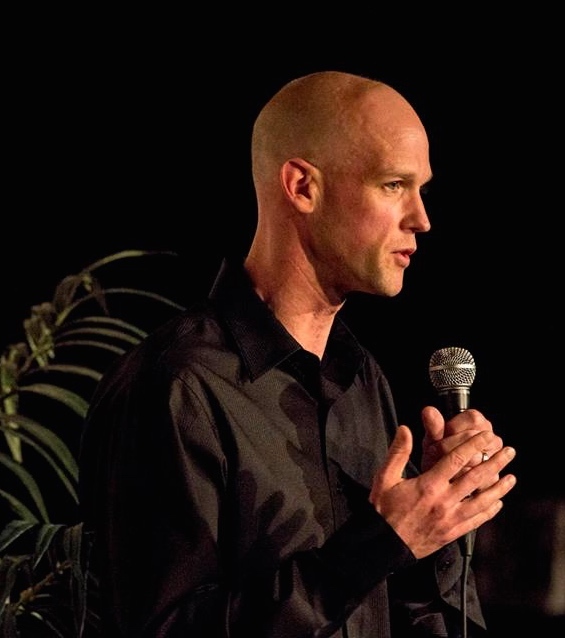 Given my training and recent races, I was hoping to run a personal best, something around 2:53, if I had my perfect day and I followed the plan my coach had set out. That being said, in theory my wave had me surrounded by people expected to run slower than me. With this setup, I figured I would start off running with the fastest people in the second wave and blend in with the slower people in the first wave pretty soon after the start. What I didn’t expect was to be leading the second wave for most of the first 5 miles with no one in sight in front of me. With a 5-minute break between the first wave starting and the beginning of the second wave, there were no runners in site in front of me. For several miles, the only thing in front of me was a police motorcycle. What took place was a surreal experience. For about 40 minutes, it felt like I was Leading the Boston Marathon!! To make this experience more epic, I had my name on my jersey, which allowed the thousands of people watching, to shout my name with well wishes. ‘Leading the Race’ You will hardly ever see a picture from the Boston Marathon without many other runners in the frame. 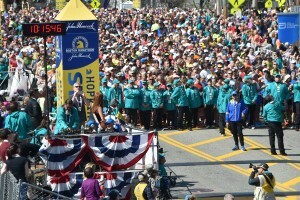 It not only felt like I was leading the Boston Marathon, it felt like I was in my hometown! At one point, another runner ran up beside me and said, “doesn’t it feel like you are leading the Boston Marathon”. My response was “You’re F-ing right! This is crazy!” I had a grin tattooed on my face those first few miles. For a guy who likes to thank as many volunteers and people who cheer for him, to have possibly having thousands shout my name, cheering me on, was beyond overwhelming. This isn’t usually an issue as I am rarely at the front of a race and most of the races I enter have few spectators and volunteers. 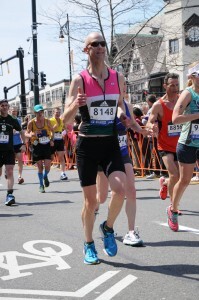 With a downhill start in Boston, it is common for many runners to start out too fast, causing them to slow way down on the later hillier miles. I was well aware of this, and with my ‘race leading’ position and extra hype from the crowd I was trying to focus on my pace so I didn’t go out to fast. A few days before the race, I decided to change the view setting on my watch to view my average mile pace, not my current pace and this may have led to my demise and the reason I started out too fast. By the time I realized I had a few miles that were way too fast for my plan, it was too late. Those first 5 miles felt great. The running was effortless and I was on top of the world, trying to soak in everything going on around me. At least I enjoyed my time while I felt good. Hitting the wall is a common term in the running world. There are many things that can cause it but it usually ends up with you feeling like you are running with a piano on your back causing you to slow way down or to stop altogether. This year in Boston, I didn’t hit a wall. My slowdown was gradual throughout, starting after mile 5. I was hoping the slowdown would come with 2 miles to go, not 21. After 5 miles, the course is predominantly flat with rolling hills. The plan was to actually pick up my pace in this section as I was running a little more conservative, slower pace for the downhill section. Pretty soon into this part, I wasn’t able to maintain the planned pace for whatever reason. I couldn’t figure it out. Everything was going fine. The weather was great. I was fueling properly with gels and fluids. My legs just started to feel heavy and I couldn’t maintain a pace that shouldn’t have been that hard for me that early in the race. From 5 miles on, my pace got gradually slower and slower. My brief moment at the ‘front’ was now long gone as hundreds of people started passing. I was running at an OK pace and thought for a while if I would maintain it I could squeak under 3 hours and salvage the run. This was my thought before hitting the hills of Newton, including the famous Heart Break Hill. By the time I reached the hill I was in jogging mode, trying not to walk. At no point did I ever feel like dropping out. In 25 years of racing, I have never dropped out of a race and I didn’t plan to start now. 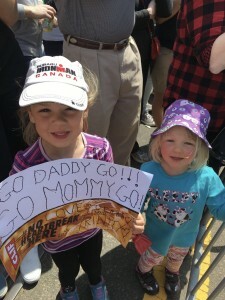 The one thing that gave me some lift running up the hill was knowing my 2 & 4 y/o girls, Sierra and Trinity, were supposed to be at mile 21, the top of Heart Break Hill, cheering us on with our friend Tara. The girls at Heart Break Hill waiting for Mom and Dad. As I neared mile 21, my eyes almost went cross-eyed as I scanned the 4-person deep crowd looking for them. Mile 21 came and went with no sight of the girls. I just assumed they didn’t make it out on the subway in time. I put my head down and trudged along. Then around mile 22, Tara somehow caught my attention. I don’t even remember what she said but I managed to hear it over the crowd noise. I glanced over and saw her with the girls leaning against the fence. I was almost past the girls when I noticed them but I took a hard left and ran straight over to them. I was beyond excited to see them. I told Tara I was having a slow race. I hugged her and Sierra and patted Trinity on the head. The girls seemed a little shocked by our encounter but it was so nice to see them. I had tears in my eyes as I ran away from them and picked up my pace for the next mile with the renewed energy of seeing the girls. For the last 5 miles, I just ran a slow and steady pace, I had stopped looking at my watch miles before, and tried to take in the whole experience and soak up the energy from the unbelievable crowed. I crossed the line with what felt like a slow jog, in 3:24. As I was herded along with the other finishers to collect our medals, blankets, and food, I burst into tears. It was a pure emotional release. I had tears of disappointment that after putting in the months of hard work and sacrifice, my plan didn’t work out as it should have. At the same time, the tears were of joy, from having my unique experience at the start, to seeing my girls, to knowing Alexandra was out running with me, to feeling enormous gratitude for finishing one of the greatest races in the world, with over 1 million spectators cheering you on making you feel like a rock star. 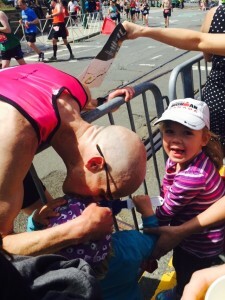 This post race breakdown is becoming common for me, as I believe I have cried after every marathon. I am not sure if others are but I am pretty much an emotional wreck when I finish these things. I guess it just means I care about my performance and the effort it takes from me and the people around me to cross the finish line. After the race, I waited for a while in the family waiting area for Alexandra. She didn’t have the race she had hoped for either but we were sure happy to see each other. 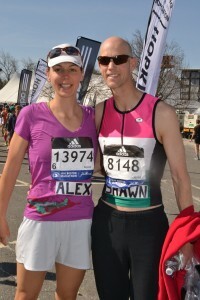 I honestly expected her to pass me in the last few miles, and had a crazy thought of crossing the finish line with her. Alexandra and I then headed to Max Brenner’s for a post race meal with some other friends who were racing and their families. This is where we were to meet up with Tara and the girls who were getting the subway back into town. Max Brenner’s is on the finishing stretch of the race, about 200 meters from the finish line. More significantly it is where I was when the bombs went off in 2013, with the second bomb going off only 50 feet away from the door. I was outside the door moments earlier and had just sat down at our table with the bombs went off. See the 2013 race report of details of the aftermath. Max Brenner’s is one of my favorite restaurants. They specialize in all things chocolate. In 2013, I couldn’t wait to get off my legs and order myself one of their famous chocolate milkshakes. In 2013, because of the bomb, I never got to have that milkshake. I didn’t know how I would feel walking back into Max Brenner’s for the first time since I was rushed out the back emergency exit, tripping over falling chairs and spilling out into the back alley. It felt as only days had passed, I could remember everything vividly. Where I was sitting, the path we took to get out (mistakenly going into the hallway to the bathrooms), what the waiter was doing, etc. Surprisingly, it felt calming, that’s probably because the most important people in my world were now with me. Last time, Alexandra was home working that day and pregnant with Trinity. In the days following the race, the feeling I get when I think of my experience going back to the restaurant is closure and that feels good. In reflecting on the race, I still have so many mixed emotions. Can a race be incredible and horrible at the same time? At least I had some amazing moments in a race that didn’t go well. Time isn’t everything but it is what we runners focus on for months and months in training, The notion of achieving a personal best puts us to bed early, gets us up early, gets us out in the rain, snow, freezing temperatures, it keeps us from that first or second (or third) dessert or drink. The easy answers for my poor performance are that I went out too fast, which is the one thing I said I didn’t want to do. The last minute adjustment to my view screen on my watch and moment in front probably helped lead to this. My initial thoughts were that my plan may have been too fast (for my talent and training) and following the plan, I went out too hard. It turns out I was even ahead of my fast plan. It didn’t feel this way at the time but I have no other easy answers. Weather was great and I felt great going into the race. During the race, I didn’t have any cramping or stomach issues. I felt like I put in the work needed to go sub 2:55. 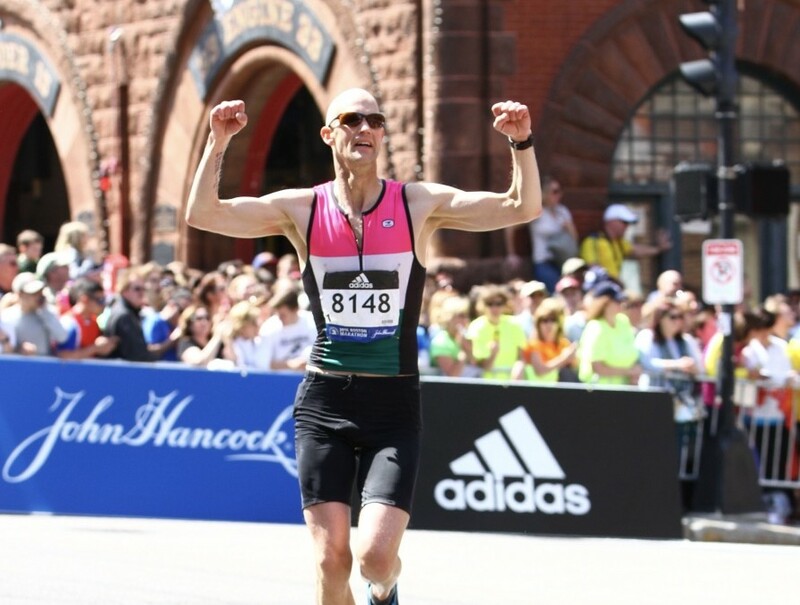 If I think of my time result from the race, sure I am disappointed but if I think of the gratitude I have for all the elements in my life that got me to the start line, the finish line, and every day in my life I am overcome with joy! 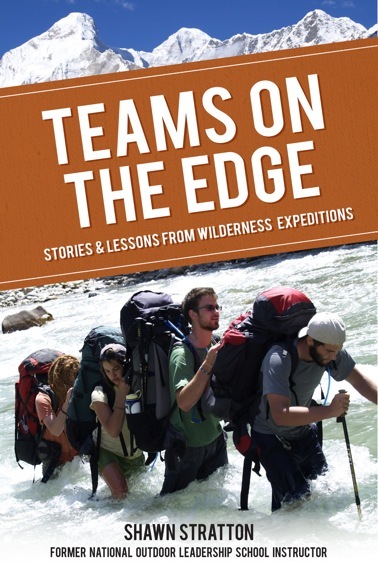 To quote the first line in my book TEAMS ON THE EDGE “It wouldn’t be an adventure if you knew the ending.” The 2016 Boston Marathon was a great adventure! Great read Shawn! Do the waves start 25 minutes apart? Or 5 minutes?